Last week was a tremendous whisky week. Four different days/nights of brand new single malts. It'll take five or six posts to get through all of that good stuff. And, man oh man, was I feeling it on Monday morning. So this will be a dry week as I let the body repair. Get some good cardio in, hydrate appropriately. I never got outrightly bombed, as I had to drive home after each event, but I'm old. Plus I like to remember the things that give me joy. 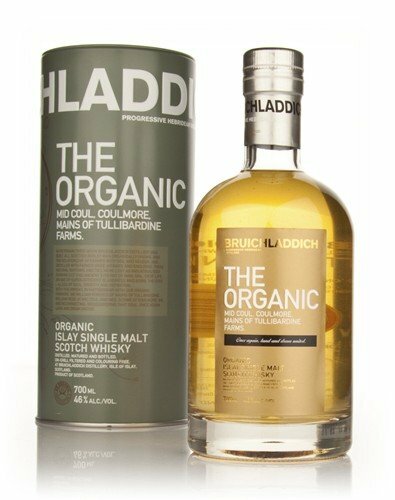 I had the opportunity to try NINE different Bruichladdich malts, just in time for all of the financial excitement they're experiencing. Since most of the samples were wee wee wee small, I was unable to form full notes, reports, ratings, witticisms, etc. Hopefully in the future there will be full reports about a couple of these, but I'll do a brief rundown right here. This winesky, made of the old Bruichladdich juice, spent most of its life in bourbon casks before Jim McEwan aced (read: finished) it in first growth Chateau D'Yquem Sauternes french oak barriques for about three years. My palate doesn't groove with Sauternes finishes, but I can definitely understand their appeal. Though I have to say, out of the five Sauternes finished whiskys I've tried, this is probably the best. The two oaks, the bourbon, the wine, and the spirit come together as a whole much better (in my opinion) than the Glenmorangie Nectar D'Or and the BenRiach 16ry Sauternes. Mostly I favored this one because I could still taste the spirit. There was still whisky in the whisky! An un-peated no-age-statement (NAS) youngin, finished in "French wine casks". Very oaky, I don't remember much else. Its cousin "Waves" (I think that's what James and I had several months ago), a pink whisky, with its ripples of raspberries and blackberries is much better. New juice plus old juice. Five years through twenty years, all in Bourbon Oak. Seemed decent, reliable. Thought I tasted some sherry oak in there, but it must have been something left over in the glass from my previous sip. There's a touch of peat in it which was nice because it provided an additional dimension. I didn't want to like this one. It's been getting raves by the boatload, and I wanted to be the punk who hated it. But I liked it. Nice brown sugary and fruity sweetness with a whisper of peat. This may wind up in the Whisky Cabinet some day. My favorite. REALLY didn't expect that. It was much different than all the others. Very light color, think pinot grigio with some amber. Lovely bready, grainy, cereal-y, grassy flavor with a floral note behind it. And almost no oak effect. All of the barley comes from three farms in Inverness. All certified organic, no pesticides. It's multi-vintaged but mostly seven years old. I'm a fan. The first fourteen years in Jim Beam casks, the last two years in first fill Buffalo Trace barrels. Very smooth, easy drinkin'. Takes all the best parts of the bourbon and leaves the oak behind. It's not crazy or splendiferous, but it's good. I just wouldn't pay its $100 price tag. This was the reverse of the Organic. I expected to swoon over this one, and it wound up being my least favorite. It's a 21 year old mystery whisky. Apparently only Jim McEwan knows how many different wine casks are employed in its design. But there's A LOT of wine it, too much for me. There's some Madeira berry stuff going on as well as considerable tartness, dried fruits, and tannins from dry sherry and some dry French red. It's $200 dollars. Think of all the good young whiskys you could buy instead. My runner up! A great peat level for this seven-year-old, about 40ppm (near Lagavulin range). It's like a peat brick floating in honey and molasses. Muscular but not overpowering. I heard so much good stuff about this one and it delivered. Ah, the supposed beast. 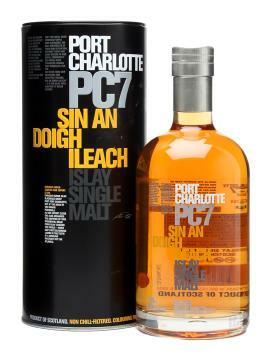 The highest peat levels in the whisky world: 167ppm. I thought it would knock the rest of my hair out, but it didn't. They finish this five-year-old in Sauternes and I think that sweet wine keeps the peat punch at bay. Which sort of made it less interesting. That or my peat tolerance is through the warehouse roof. Either way, let the lab experiment loose! And I wonder, why so much $$$ for this? C'mon peatheads, you know how much great stuff you could get for $200+? How about two bottles of PC7? Sadly the PC7 costs almost as much as the Organic and Ten combined, but that's due the cask strength (61% ABV), the market's demand, and the scarcity. 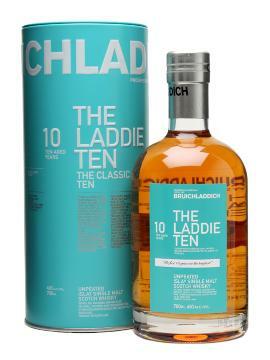 I think the Bruichladdich (peated and unpeated) spirit is pretty solid on its own -- as these top three demonstrate -- so while I can understand the continuing exploration into "Ace-ing", someone else can pay for that. I'll pay for the naked whisky, thanks.